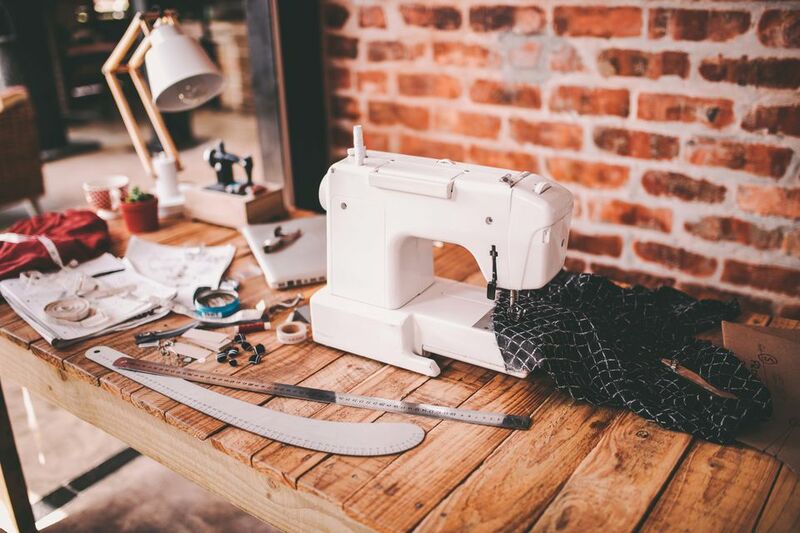 Creating the perfect sewing space on a budget presents many interesting challenges. From the floor plan to storage, organization, cutting table, and sewing machine placement your space will be uniquely your own. See ideas on how to make choices and keep the entire project on a budget. Learn what you need to consider no matter what size or where your sewing space is located. This suggested sewing room floor plan can be adjusted to meet your sewing needs. It can be an entire room or a portion of a room. If you are building a sewing room from the bare bones, consider having extra electrical outlets installed. It's amazing just how many things will be plugged in in a sewing room. There are special considerations if you have small children. You must keep all of the sharp sewing implements safely stored and out of their reach. Scissors, pins and rotary cutters, just to name a few, do not belong in little hands. A storage location that is close at hand is the easiest. When your stash of fabric grows, you may need to be creative. Remember to fabric it out of direct light so you don't find it faded when you are finally ready to use it. A good habit to develop is to preshrink fabric immediately after purchase and store it in containers of one form or another, even if it's just a plastic bag, to keep it clean and odor free. Under-the-bed storage is a great place to keep the fabric out of direct light and out of sight. A storage system with labeled bins for fabric and sewing notions such as buttons and zippers will keep them organized and easy to find when you need them. Your system can include individual cubbies for bins of fabric and shelves for baskets of notions. Three-quarter inch sanded plywood can be used to build the shelving and supports. Or, you can get a ready-to-assemble unit such as from IKEA. The top shelf can be utilized for interfacing, rolls of cording, stuffing, and bolts of fabric which didn't fit in bins. Building a fabric stash is wonderful, but organizing it will reduce frustration. Labeling your fabric bins with fiber content, width, and the amount of yardage can save you hours of unfolding and re-folding your fabric when you are looking for enough fabric for a particular project. As your stash grows, attempt to keep like types of fabric together and label the packaging to make it easier to find what you need. Table space is essential for comfortable sewing. Having the amount of table space you want and keeping it low-cost can be a challenge. A kitchen or dining room table can serve as a sturdy sewing machine table. Do not use a folding card table as the vibration from the sewing machine will cause it to bounce all over such a flimsy table. An economical option for a sturdy table is to watch thrift shops and yard sales. Sandpaper and a coat of paint might not work your you family dining table but it will for an economical sewing machine table. A cutting table with storage can keep your projects all in one room without having to take your patterns and fabric to your kitchen table. There are furniture solutions from manufacturers such as Sullivans that available from retailers like Jo-Ann Fabric and Crafts. A quilter's table with storage can maximize your space and give you the cutting surface you need. You can keep your eye out for a used one in online ads or at estate sales to save on buying a new one. Cabinets above the sewing machine desk keep tools and supplies at hand. You can buy unfinished kitchen cabinets and stain them to match your sewing machine table. By attaching the cabinets at a usable height, the space above the cabinets makes a perfect location for displays. One word of caution—always be sure to close the cabinet doors, no matter how involved you are in what you are doing. Standing up without looking up with a cabinet door directly above you is not a pleasant experience. If you are creating a corner sewing machine counter, you can use desk legs from yard sale desks to support the corner. Be sure to place the legs so you can switch back and forth between the two sides. Machine embroidery, pattern making software, and free patterns are just a few of the reasons to consider a computer area into your sewing room. Be sure to check your local home building center if you will be converting countertop into a desk. Gommets work very well for the sewing machines and for computer wires. Over the years computers and sewing machines will change. Having flexibility in your plan is essential if you change things regularly. The more organized you are when you start your sewing space, the easier it is to keep it cleaned up and put items away between projects.